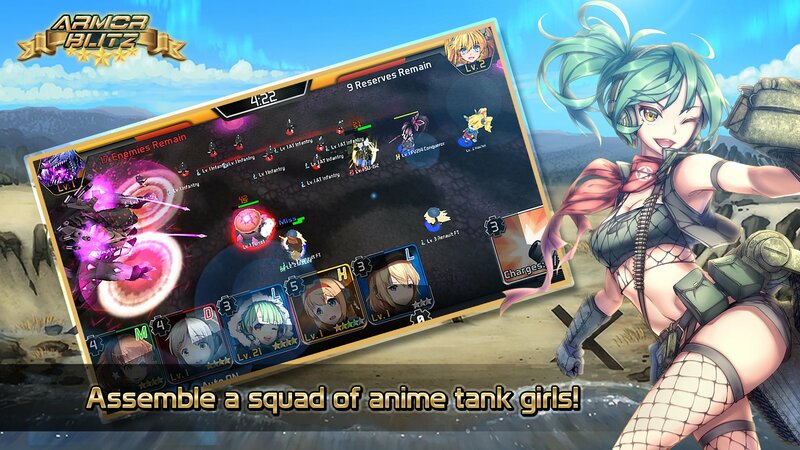 Armor Blitz is a mobile and browser game where you assemble a squad of anthropomorphic tank girls from the WWII era and lead them to battle. The world takes place in Valhalla, resting place for the spirits of warriors and weapons. What was once a peaceful afterlife has become a warzone -- the Corruption have entered your world and begun to invade. Collect tank girls to grow your army, upgrade them to get stronger, and take back your land from the evil Corruption. As the newly appointed General, only you can take command and bring victory to the spirits of Valhalla. Welcome to Armor Blitz, where you are the General of a fantastical squad of WWII-era tank girls. Enter Valhalla, the afterlife for fallen spirits. When a mysterious force called The Corruption strikes and ravages the lands of Valhalla, it is up to you to take command and push them out. Gather your army of tanks, enhance their capabilities in combat, and play strategically. It's your move, General. Each character you encounter throughout the game is carefully designed with their own history. Each tank and enemy has hints of background coming from their historical past. Level them up and build your relationship status to make them even stronger! Although you take the role of General, that doesn’t mean you can’t help your army! Use abilities, call in reinforcements, and carefully deploy your tanks to yield victory. The story is funny, engaging and impressionable. Explore the world of Valhalla, the resting place for warriors. It has been a while since our last patch – sorry for the wait! We have teased the new tank previously, and she is now going into the patch: The Löwe heavy tank. The other teaser we showed on April 1st was the Ratte, but that was just an April Fools joke, as I hope you’ve all figured out by now. Sorry, no Ratte! The Löwe (Kristy) will be earnable through the Easter event, lasting from Apr 10th to May 1st. You can log in now and start finding Easter Eggs! Make sure to watch the intro story to discover how they were laid out upon Factoria. Since this is taking the place of the usual ANZAC event, you can earn Sonya the Hedgehog in this event along with Kristy the Lowe. Just check on the event milestones page in-game. Keep an eye out for a limited package sale between Apr 18th – Apr 29th! Login between Apr 30th – May 6th for a Golden Week Login Bonus of 5 Candy every day you sign in! Level cap increase is being worked on! Easter Event! Gather Bunny Ears, Pink Eggs, and Green Eggs to earn rewards like the new Lowe and last year’s Hedgehog! New Tank: Lowe, 5-star Heavy. Kristy is here to support your army with a powerful defense! She packs a group buffing aura that will be useful no matter the situation. Welcome back to the Armor Blitz Christmas season! The holidays are in full swing as tank girls and nekos across the land have begun buying presents for their friends and loved ones. But something is amiss . . . and it’s up to you to solve it! Some of the QoL changes we’ve heard have been implemented. Reserve slots can now be expanded up to 200. This should accommodate the new units that were added to the game since launch. Also, with screens getting wider (Samsung, Apple, LG, etc. ), we took the time to adapt our screen resolutions to scale properly. So if you own one of those phones with up to 18.5:9 resolution, then you can play on fullscreen mode! Please report back if there are any issues that we didn’t catch. Lastly, emblem batch selection is available in the recycle screen. This will let you recycle a lot of those low tier emblems a bit faster. Christmas event is on! All previous Christmas characters are available through the event. Christmas tanks are available in Recruiting! That includes the KV-8 flamethrower heavy in the 4-star category. New tank, Lena the T-54 5-star is now available in the Christmas event! Maximum Reserve Slots are now 200. You can upgrade your reserve capacity in the Army Screen -> Reserves tab. Emblem filtering feature in recycle screen to batch select all of 1, 2, or 3-star emblems. Hunt down corrupted turkeys and unlock Tessa, the T95 GMC, and Julie, the M3 Halftrack, to lead your forces to victory! - Julie, M3 Halftrack is introduced with a unique ability, Reinforcements! Call in three cat infantry to support the team. She also provides a significant buff to all infantry around her. - Sophia, the KV5 is now Enhanceable version + Relationship is now available. Feed her candy to unlock the story!